Graphic design can be defined as the art of combining text and pictures to create a visual design, which would be used in the print and publishing field. Regardless of the fact that more people are tilting towards reading in the digital form, the print and publishing media are still flourishing with a lot of new publications joining the field over the globe. The use of promoting materials like danglers, posters, flags etc by the corporate is on the rise also. ToXSL Technologies gives 100% real-time, practical and placement focused Graphics Designing industrial training in Chandigarh. Our Graphics Designing course focuses on basic level training to advanced level training. 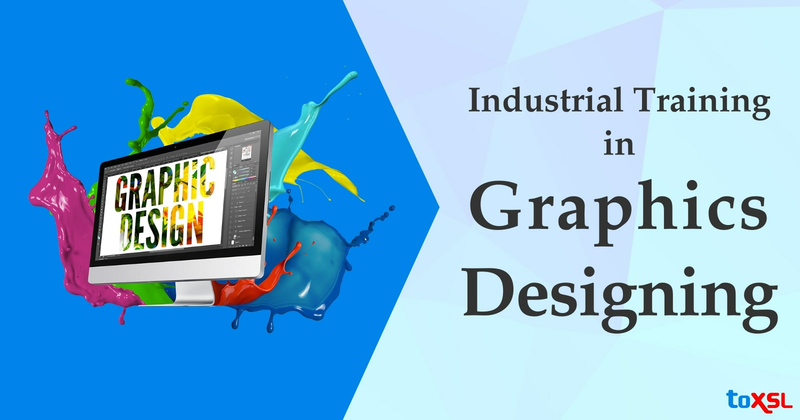 Our Graphics Designing industrial training in Chandigarh is totally focused to get placement and certification on Graphic Designing after completion of our course. Our team of Graphics Designing trainers is Graphics Designing certified professionals with all the more real-time experience on live projects. Our syllabus for covers basic to advanced level of the program alongside the live examples. ToXSL Technologies is outfitted with phenomenal lab facilities and splendid infrastructure. We additionally deliver Graphics Designing certification training path for our clients. Through our allied Graphics Designing Training Center, we have trained more than 2000+ Graphics Designing students and gave 100% placement. Our Graphics Designing Training course fee is value for money and customized course fee dependent on every student's training requirements. Our Graphic Designing industrial training program has been structured in such a manner that it makes students a professional expert. The graphic design course explains how to make designs for Logo, Newspaper, Advertisements, Business card, website, newsletter, promo materials etc using software like Photoshop, Illustrator, Coral draw and InDesign. This Graphics Designing Course at ToXSL Technologies is thoroughly job-oriented with more significance being given to practical sessions. ToXSL Technologies is the best company for Graphics Designing industrial training in Chandigarh. We have exceedingly talented trainers who prove to be a turning point in your career. So don't hold up any longer, visit us today.